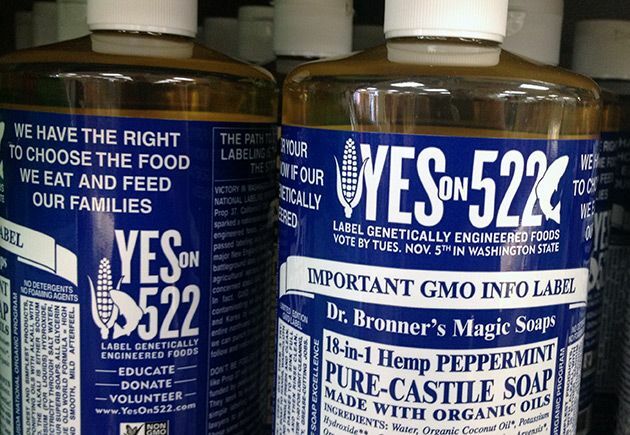 While many organics companies have contributed to Washington’s 522 campaign, none has gone to the mat like Dr. Bronner’s, which prominently displays a Yes on 522 ad on its soap labels. “Taking sides on a political campaign like that is totally unprecedented in the world of product labeling,” Robert Parker, the president of Label King, the printer of the Dr. Bronner’s labels, tells me as we float among the breakers during a company “board meeting”—an early morning surf at Carlsbad’s Terramar Beach with Bronner and a handful of his employees and friends. This kind of activism might have been impossible just a few short years ago were in not for the Supreme Court’s Citizens United ruling. That ruling established that people, when acting together as owners of unions and corporations, do not lose their First amendment rights when they choose to use those entities to advocate in the world of electoral politics. Congressman John Yarmuth believes that Citizens United was a bad Supreme Court decision. The two year old free speech ruling found that people don’t have to give up their right to associate freely when they want to speak freely and vice versa. And it allowed unions and corporations to facilitate political speech more easily. Congressman Yarmuth, by way of overturning Citizens United, has written a Constitutional Amendment that, as he puts it, establishes “financial expenditures … do not qualify as protected speech under the First Amendment.” He further argues that the financial expenditures don’t even have to clearly express support or opposition for a candidate. That speech would no longer be protected by the Constitution. To me, this seems odd. I used to work for John Yarmuth on occasion, writing articles in his former newspaper, LEO, about public policy and other matters. The reason Yarmuth’s claim seems odd is that his newspaper regularly endorsed candidates for political office and regularly published stories expressing support or skepticism toward political actors. I wonder if Yarmuth believes that his Constitutional amendment would hamper newspapers that endorse candidates as LEO did and still does. Most newspapers are owned by corporations and it would be foolish to argue that a newspaper endorsement is not both a corporate expenditure and an “in kind” contribution, both of which are targeted by Yarmuth’s amendment. After all, it costs money to print a newspaper and newspaper endorsements are often extremely valuable to politicians during a campaign. Now I expect that John Yarmuth doesn’t mean to single out newspapers or other media outlets for direct government regulation of political speech and he may respond that the government would use discretion and restraint when choosing which media outlets receive this higher level of scrutiny. The problem, of course, is that Congress has already tried to regulate political speech in very scary ways. And they’ve done it by precisely claiming that spending money to advance an idea … isn’t really speech. In 2010, the Supreme Court decided a case where advertisements for a political documentary were banned by the Federal Election Commission. And the Commission banned the film from being shown on Pay-per-View for weeks prior to elections. During the oral argument, justices asked the government’s lawyer if he thought the Federal Election Commission could even ban the sale of books, or publications for your kindle, that contained so-called “express political advocacy.” The government’s lawyer effectively said yes, we can. That case was Citizens United. And the high court rightly threw out that kind of dangerous government censorship of political speech. So a few questions should be put to Congressman Yarmuth: Do you really believe under your proposal that newspapers like LEO wouldn’t be subject to direct government regulation of their content? Is government censorship really the answer here? Ben Jerry Cohen of Ben and Jerry’s is quite sure that money isn’t speech, but surely that doesn’t include the money he wants to use to buy rubber stamps that say “Money isn’t speech.” If the money he’d use to facilitate his blatant, naked act of communication isn’t speech, he should have no problem with the government outlawing the sale of rubber stamps for the purpose of communicating controversial ideas. One has to wonder about the potential use restrictions that might come with the purchase of posterboard, sharpies, cameras and laptops. There are a few ways to interpret this. One, the statement makes it sound like he doesn’t actually understand that his campaign is barred by federal law from coordinating with a supportive Super PAC, so claiming to have “no entanglements” with them may reveal a serious lack of understanding of the basic landscape of electoral politics. But, if like any good candidate, Carey does clearly understand how federal election law prohibits the very activity that he so proudly eschews, then it sounds a lot more like he’s accusing his opponents of coordinating with SuperPACs that support their candidacy. He would seem to imply that his opponents are violating federal law. Of course he’s not saying that. What I believe Carey means to say is that he’s not encumbered by having “big money” supporters, turning the liability of fewer monied supporters into a campaign strength of the appearance of relative independence and principle. Unfortunately, the populism that goes along with demonizing Super PACs means rejecting much of the First Amendment and making false logical leaps about the nature of corruption. For anyone who cares about vigorous and freewheeling debate that the First Amendment protects, it’s important to note the cynicism of a candidate who believes that because wealthy people like a campaign, that candidate is therefore compromised and corrupted. That equation – financial support for a candidate’s run equals explicit corruption – is the kind of thinking that gave us the freedom-harming incumbent-protecting McCain-Feingold campaign finance laws. I’ve met Marcus Carey. He seems more circumspect and earnest than this kind of political game would suggest. Ideas aren’t vying for market share? Excuse me? Mr. Fish, for Heaven’s sake, isn’t your article precisely an attempt to promote some ideas over others? To fire off a meme or two into the ether in hopes that it sticks? Isn’t that what I’m doing, too? A gathering consensus is the sign of an idea winning. Opinion polling is often meant to capture the ideas that people hold. Getting people to hold certain ideas is a struggle advertisers and marketers have engaged in for a very long time. When I buy Coca-Cola (yum! ), I’m not not making a decision about whether or not you buy Coca-Cola or Pepsi. My choice on behalf of The Real Thing doesn’t impose that choice on you. Electoral politics are different. If I vote for Coca-Cola and you vote for Pepsi and others do the same deliberation, one wins and one loses. For all of us. That seems to me to suggest that if liberty matters anywhere, it’s when you want someone empowered to regulate my behavior. I should have the right to oppose that with any voluntarily available means. Coke only regulates my behavior when I choose to drink it. Ideas aren’t the same as candidates. Ideas aren’t precisely the same as regulations or ballot initiatives. Ideas have power, yes, but they only have power when they’re heard and then acted upon. An ad for Coke is as much an attempt to influence me toward some behavior as an ad for John McCain. The airtime costs the same (or it should). That doesn’t make them different. The difference, and I think many of the reformers would agree, is the practical outcome of me being influenced toward a particular decision. And that’s where our paths diverge. Many reformers would say that political outcomes affect us all, we need to make sure that no particular voice or set of voices will distort the election, unlike ads for Coke. We’ll apparently have to leave aside the fact that only individuals get to vote, they only get to vote once and that corporations and “ideas” are denied that privilege. The large question is, which comes first, freedom of speech as guaranteed by the first amendment or democracy? The Citizens United majority assumes that the two are the one and the same, assumes that the free speech value is the very content of democracy and that therefore no value can stand as a counterweight to it. Whoever said that democracy and free speech were BFFs to begin with? I haven’t read all (or even most) of Justice Kennedy’s majority opinion, but does anyone really believe that democracy protects free speech? I’m certain Anthony Kennedy doesn’t. Another assault on the Citizens United decision took a more legal, doctrinal form. In United States v. O’Brien (1968), the Court ruled that when speech and non-speech are “combined in the same course of conduct,” and the regulation is aimed at the conduct part with only an “incidental restriction” on the speech part, it will pass constitutional muster as long as it furthers an important government interest (like the interest in fair and undistorted elections, an interest the United States strongly advocates in other countries). On the O’Brien model it could be argued, and was argued at the conference, that rather than being speech, the giving and spending of money in elections is conduct that has the effect of aiding speech by ramping up its volume. The idea is that while contributing and spending money may be a means of exercising a right, it is not itself the right, and its regulation can leave the right intact. (You have a right to shout to the world, “I love Mary,” and you may wish to hire a skywriter to proclaim that message, but were an ordinance to forbid or restrict skywriting, your right to express your love will not have been infringed.) Is there political speech without money? Yes. 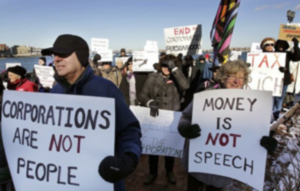 Is money sometimes useful to the expression of speech, including political speech? Yes. Is the useful vehicle the same as the expression it facilitates? No. Is it the money that talks? No. Money doesn’t talk; it aids talk and under O’Brien regulating its expenditure is regulating conduct. Flag burning should be protected speech to the extent that the flag didn’t cost you anything. Do I have that right? The flag facilitated the expression. The flag itself is not the expression. To get to the point where you separate the facilitation of speech from the words or message itself, you have to believe that the First Amendment doesn’t, in fact, protect the use of any medium to express those ideas. So, any speech that disrupts an “important government interest” where you use YouTube, a copying machine, a bullhorn, a printing press, your local TV or radio station, a flag and some matches, a film production company or any other facilitation of speech … would not get the same First Amendment protection as the same speech delivered on a soapbox on a busy street. Actually, scratch that. The soapbox probably would help your voice carry a little farther down the block. Let’s say that the government has an important interest in “fair and undistorted elections.” If a community is voting on whether to adopt Soylent Green or Soylent Yellow as its primary source of food, it would be fine for Chuck Heston to report to those gathered on the street that Soylent Green is, as a matter of fact, people. If Chuck wanted to use, say, YouTube, a printing press, a corporate organization, a consulting firm, a film crew or a few paid spots on his local television station to deliver that message, he might well be prohibited from doing so. That is to say, if Chuck Heston wanted to “distort” the election by leveraging his message with media, he would not be free to do so. Every action but his frantic hand gestures and piercing pronouncements could be regulated as something other than speech. That leaves the government, once again, in the unenviable position of having to decide what kinds of speech distort elections and what kinds don’t. An attempt to regulate money (leverage) once again becomes a de facto regulation on the content of speech. It’s precisely what so many campaign finance reformers want: government regulation of publicly expressed opinion. That’s precisely what the majority in Citizens United wanted to prevent. SCOTUS will rehear the Citizens United case tomorrow. Here&#8217;s the most reasoned and legitimate take on the case.